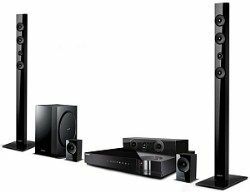 Samsung's flagship 3D Blu-ray cinema system uses valve amp technology | What Hi-Fi? It's not just Samsung's speaker docks that are getting the valve amplifier treatment this year, the new HT-E6750W home cinema system is powered by the company's new valve amp technology, too. The flagship Blu-ray all-in-one system comes in 7.1-channel form, with floorstanding front speakers, wireless rear satellites and the company's '3D sound' technology. The system combines valve amp technology - two glowing valves are visible in the main unit itself - with digital amplification, which Samsung says - predictably enough - combines the best of both technologies. There's an iPhone/iPod dock, Bluetooth support and Samsung's Smart Hub content platform for accessing streaming video and more. Featuring built-in WiFi its due out around May, pricing is as yet unconfirmed. First mentioned at CES, the system was on show at Samsung's European Forum. Also on display was a soundbar system, the HW-E551, which offers a clever split-speaker design, allowing you to either place the soundbar below your set or separate the speaker in to two and place them either side of your TV. There's a wireless subwoofer, support for Bluetooth streaming and two HDMI inputs and an output. More news on release dates and pricing as we get it.